This is a tall evergreen coniferous tree species that is common in south-eastern and western BC. Tree to 50 (60) m tall; narrow crown, with noticeably drooping leader (growing tip); young twigs covered with mix of short hairs and longer hairs; bark rough and scaly, strongly furrowed and ridged in older trees, dark brown to reddish-brown. 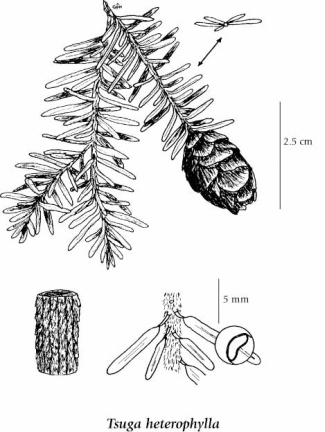 Needles somewhat flattened, rounded at tip, 8-20 (25) mm long and characteristically unequal in length, spread unevenly at right angles to the branches to form feathery, flat sprays; glossy and yellow-green on upper surface, almost entirely white-stomatiferous on the lower. Seed cones maturing from green to brown, 1.5-2.5 cm long, oblong-egg-shaped; pollen cones yellow, 3-4 mm long. Hybrids with T. mertensiana have been reported (T. x jeffreyi [Henry] Henry) but are considered rare; some reports may be at upper elevations of its range where T. heterophylla may take on some characteristics of T. mertensiana, e.g., leaves less 2-ranked and stomatal bands on the lower leaf surfaces less distinct. Moist to dry slopes, river terraces and flats in the lowland and montane zones; common in and W of the Coast-Cascade Mountains in W BC and in SE BC; N to SE AK and S to N CA, N ID and NW MT.